Torturing Democracy: How Did We Get to This Place? The video is 90 minutes divided into three segments: Part 1: From 9/11 to Waterboarding – The Inside Story; Part 2: From the CIA to Guantanamo and Part 3: Immunity of US Officials. NARRATOR: In other words, the President has the power to suspend – or simply ignore – the fundamental laws of war. That includes Geneva and its guarantees of basic human rights to prisoners and civilians alike. RICHARD ARMITAGE – Deputy Secretary of State (2001-05): Our views were well known in this matter. We were not on board. RICHARD ARMITAGE: For the most part, the Department of State was left out of this discussion, I think precisely because we’d have no part of it. NARRATOR: That is, if officials – including President Bush – were accused of torture or inhumane treatment, they could be prosecuted for war crimes. 40 “Your Draft Memorandum of January 9th.” Taft, William H. IV. January 11, 2002. 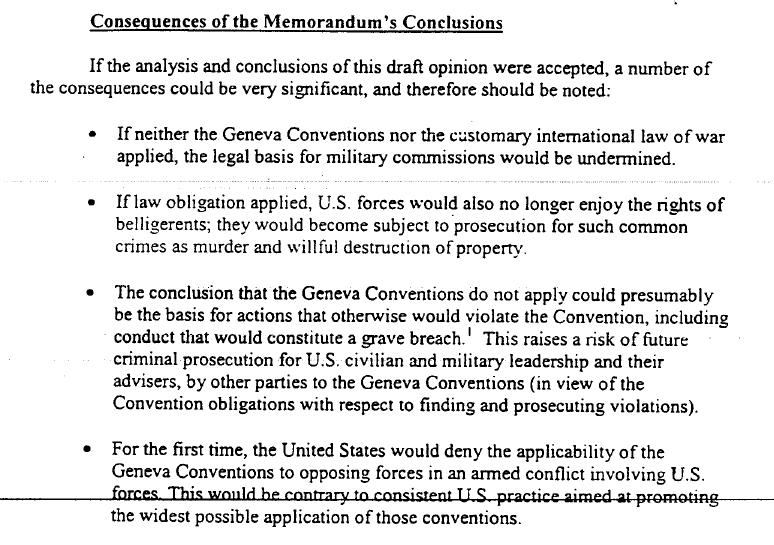 The conclusion that the Geneva Conventions do not apply could be the basis for actions that otherwise would violate the Convention, including conduct that would constitute a grave breech. This raises a risk of future criminal prosecution for U.S. civilian and military leadership and their advisers, by other parties to the Geneva Conventions. The draft memo sent to the State Department’s Legal Office was dated Jan 9, 2002. A 40-page draft memo responding to Yoo at DOJ’s Office of Legal Counsel was sent back two days later by State’s Legal Adviser William Taft IV, saying that “both the most important factual assumptions on which your draft is based and its legal analysis are seriously flawed.” More here. Two principals from the State Department are included in the video. Richard Armitage who was Deputy Secretary of State under Secretary Powell had a lot more to say in his extended interview here. The interview of Colonel Lawrence Wilkerson, who was Secretary Powell’s Chief of Staff is here. When I hear about a “Truth Commission” or something similar being talked about, my initial reaction has been — just let it be. I’m sure I am not the only one who feels that we need to turn a page. Like many others I think that it is important to look forward and not backwards, and yes, it is important to remind ourselves that we live in dangerous times and that there are real security threats out there. But I must admit that after watching this entire video and reading the related documents and interviews, I can’t say that we should just ditch the idea of a commission. The narrative that what happened here was the work of a few “bad apples” has now moved into the realm of fiction. We teach our children that actions have consequences, but in this case — what are the consequences? When you come to think of it, there is another reason why we need to look at how we came to this place — we need to, because this happened in Washington after all, and Washington insiders never really go away. Mr. Rumsfeld was SecDef in 1975 and came back to the same job in 2001. Mr. Cheney was WH Chief of Staff in 1975 and came back many different times. We are now seeing former Clinton staffers come back to serve in the new administration. How many Yoos, Gonzaleses and Addingtons are out there, waiting in the wings for repeat engagements in 2012, 2016, or 2020 and beyond? Folks in their forties now, may still show up inside the beltway in the next 30 some years down the road — because they never really go away. I think we need to know how we got to this place; we don’t want to be asking the same question 20-30 years from now: how did we get here? But will Congress find its spine to look hard — not just at what happened but also at what they had failed to do? Foreign courts should not have to render judgment on our mess … isn’t that what we do to third world countries and their dictators? The larger question becomes — ought we not, as the bright shining city upon a hill, shine some light on this darkness in our national soul?